This entry was posted on Thursday, January 27th, 2011 at 11:43 am and is filed under Article, presentations. You can follow any responses to this entry through the RSS 2.0 feed. You can leave a response, or trackback from your own site. I completely agree with the one point/one slide maxim. Perhaps there is a moment in a presentation where you would like to set out some bullets, to summarize or conclude a particular set of points, but a presentation completely full of bullets will die quite quickly. It just goes to show what a memorable deck of slides you put together, so much better than lists of bullets. And yes I have to agree occasionally bullet points have their place, but only very occasionally. 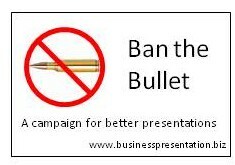 Yes with the benefit of hindsight, I have given some really awful presentation in the past, even now if we completely Ban the Bullet, I will have to update some of my presentation skills slides. But I think it will be worth it!